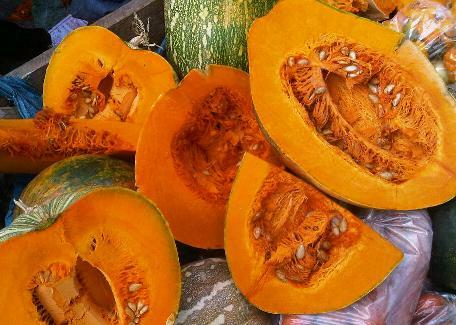 Jamaican Pumpkin Soup (The Recipe) - A Sat'day family favourite! Of all the soups I have had, personally I think our Pumpkin Soup is surely the best (at least in my household). The ways of preparation varies base on your liking and can take less than an hour to prepare. My all time favorite was the traditional way of preparing it with chicken until I was introduced to the meat-less ital version! Cook peas, separate strain and add to cooked mashed pumpkin, add yams, vegetables and dumplings and the coconut milk. Bring to a boil and allow to simmer for at least 20 minutes or until cooked. Then add all other ingredient and leave to simmer for a further 15 minutes. Don’t forget the scotch bonnet pepper. And it would be a good idea to ensure that the pepper doesn’t burst in the pot unless you like fire coming through your ears. Meat lovers, no need to feel jilted, this dish can be easily customized to suit your taste. You can add or remove ingredients (as long as the pumpkin stays as it is the main ingredient) as you desire. So feel free to add beef, fish, some chicken or pigs tail to your pumpkin soup. And to make it even more authentic there must be some 'chicken foot' in that soup. Pumpkin soup is just not the same without some chicken foot - yes, it's chicken's feet (lol)! Pour soup in blender and puree for a minute - blending for too long will cause the soup to be a bit frothy. Pour into your favorite bowl and enjoy. Editor's note: Today you can find Jamaican pumpkin soup in ready made packages & sachets not only in Jamaica, but overseas as well. Geddes, Maggi and Grace are notable Jamaican brands that package this Jamaican delight. They have, for example, pumpkin beef soup & pumpkin chicken soup. If you are overseas, check with your local Jamaican or Caribbean grocery store, chances are they'll have it! You are welcome to visit my Jamaican Grocery Shopping storefront, courtesy of Amazon and check it out there. Return to Jamaican Food from Jamaican Pumpkin Soup. 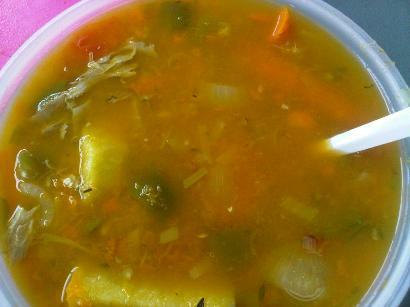 Return to HomePage from Jamaican pumpkin soup.